The use of a defective product can yield a broad range of injuries. Regardless of the severity of your injury, the company that developed and approved the faulty merchandise must be held accountable for its negligent actions. An experienced attorney can help you obtain the compensation you need to cover costs associated with the defective product’s use, including medical bills, property damage, lost wages and pain and suffering. At Chambers & Noronha, we are committed to aggressively litigating for our clients in an effort to help them obtain the best results possible. We have a well-known reputation within the legal community. Our opponents know that our clients are serious about their cases when they see that we are serving as their legal representation. In some cases, negligent behavior can lead to death. We are well-equipped to zealously represent family members who have lost a loved one due to a defective product. We make an investment on behalf of our clients, so they can proceed with confidence. We will not charge any fees until or unless we obtain compensation for you. 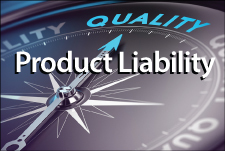 To schedule your free initial consultation with one of our product liability lawyers in Santa Ana, please email us or call 714-558-1400.